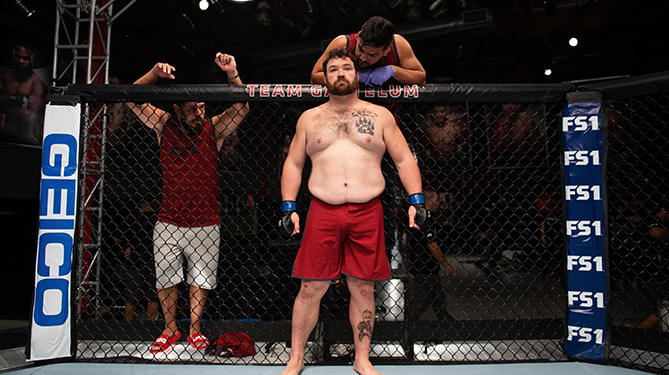 The first finalist on The Ultimate Fighter: Heavy Hitters has been determined after heavyweights Justin Frazier and Michel Batista clashed on the latest episode. 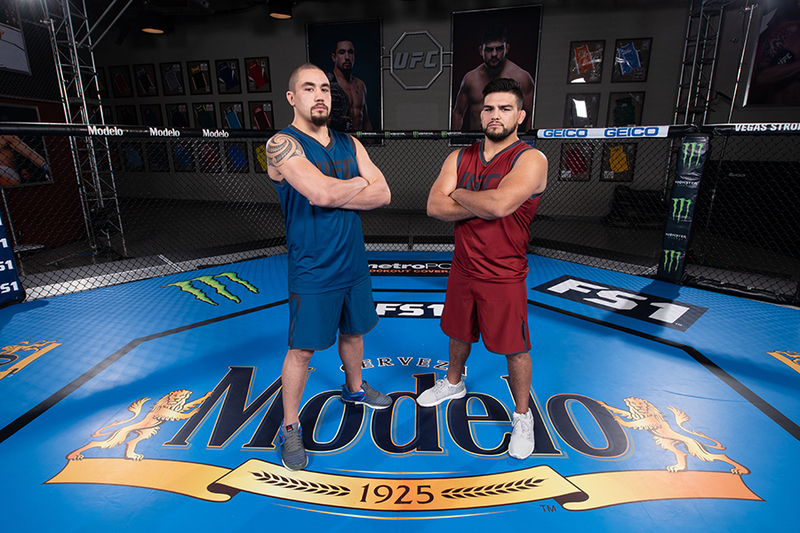 Prior to the battle between Team Gastelum and Team Whittaker getting underway this week, there was still plenty to deal with from the fight that capped off the elimination round last week. Actually, the fallout wasn't as much about the fighters involved as it was Maurice Greene becoming rather loud and obnoxious after the bout was over as he started going after the fighters on Team Whittaker. The coaches and fighters quickly realized that Greene had enjoyed a few too many drinks before coming to the gym for the fight and his outbursts were a distraction for everybody. Greene ended up in an argument for the second time with former opponent Anderson da Silva, and his behavior was so out of line that the fighters from Team Whittaker decided to have a dinner in the gym rather than return to the house and deal with him again. Meanwhile, Team Gastelum did return to the house and Greene was once again fired up thanks to drinking a little bit too much while the rest of the fighters were celebrating Macy Chiasson's win and her upcoming birthday. Sadly, the party was interrupted by Greene's behavior and that finally forced coach Kelvin Gastelum to sit down and talk with the heavyweight fighter about the way he's been carrying himself lately. "It's a bad representation of our team," Gastelum said about Greene. "It's a bad representation of who we are as martial artists. It's a bad representation of himself. He's got a family at home that's going to be watching. He needs to behave himself." Greene promises to clean up his act and behave like a professional fighter should. Unfortunately, almost immediately after Gastelum and his assistant coaches left the house, Greene was right back to partying and drinking too much while disturbing some of the other fighters from his team. The next day, all the fighters in the house decided that they are going to go to a local Las Vegas tattoo parlor to get inked together to celebrate being part of the show this season, but Team Gastelum fighter Marciea Allen is nowhere to be found. Eventually, they find her sitting alone outside and that's when she breaks the news that she's asked for a flight home because she's contemplating leaving the competition. Allen was already eliminated from the tournament but that had nothing to do with her decision to leave the show entirely. Instead, Allen reveals that Greene's behavior over the past few weeks has finally crossed a line for her and she no longer feels comfortable living under the same roof as him. With Marciea threatening to leave the show, the rest of Team Gastelum gathers for an intervention of sorts to finally sit down together and hopefully hash out their feelings while letting Maurice know just how much trouble he's caused. Allen is finally able to vent her frustrations about Greene's behavior and he apologizes for lashing out and acting foolish while drinking all season long. Greene promises to avoid Allen if that's what she wants but, more than anything, the team just wants her to decide to stay. Allen opts to remain in the house for the rest of the season with Greene vowing to clean up his act. With that drama behind them, it was time for the first semifinal fight of the season, with Batista vs. Frazier in the heavyweight division. Batista is keeping his distance as the fight gets underway, staying on the edge of the cage with Frazier pressing forward but still not engaging. Both fighters are being very cautious early as Frazier unleashes the first big right hand that clips Batista on the jaw. Frazier starts throwing some low kicks that sting Batista's legs. Frazier continues to pressure forward with quick combinations, including an overhand left that lands. Frazier is being smart to hit and move and stay out of range from Batista's takedowns. Frazier continues to pepper away with leg kicks, twisting Batista around with the force of his strikes. Batista has barely thrown any strikes, instead opting for a defensive posture while constantly backing up against the cage. Again, Frazier is being cautious not to overextend because he knows Batista is just waiting for the chance to take him down. The fighters exchange in a big series of shots against the cage, with Frazier again landing with better power and accuracy. Batista is still circling away and he eats another big left hand from Frazier. As time ticks away, Frazier's confidence only seems to grow with each punch landed and with less than a minute to go, he's really starting to up the intensity with his combinations. Finally, Frazier jumps in with a Superman punch — a stinging left hand — that drops Batista down to the ground. Frazier follows up with a series of blistering punches with Batista just turtled up on the ground. Referee Herb Dean implores Batista to fight back, but when he doesn't react, the fight is finally stopped. "Michel is an Olympic wrestler so I knew I had to be able to defend the takedown," Frazier said after the victory. "I am not an Olympic-level wrestler, but I am a very strong wrestler and my MMA wrestling is very good. We practiced standing and taking the center of the Octagon because we weren't going to take his bait of going against the cage. He tries to get you there so he can shoot on you, but in open water it is hard to shoot on someone and we knew I needed to stay there. "That's my first time standing with someone and dropping them for a finish like that. I have finished people on the ground but never like that. Team Gastelum is by far the best coaching staff I could have asked for. When I heard it was him, I prayed I would be a part of the team. He and I are really similar and I learned so much from him. This was an amazing experience. You're talking to the next Ultimate Fighter Champion." The win makes Frazier the first heavyweight finalist on the show. Next week, one of the women's featherweights will join him, as Julia Stoliarenko from Team Whittaker takes on Pannie Kianzad from Team Gastelum. 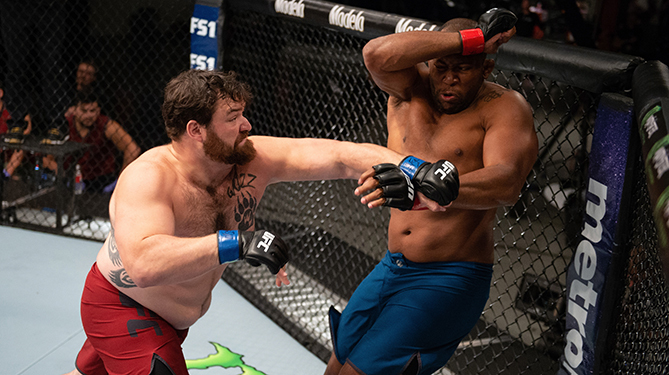 Who will move in to the finals of The Ultimate Fighter: Heavy Hitters? Tune in next Wednesday night at 10pm ET on FS1 to find out.